Cozy Chicks: A New Kelly Flynn Mystery Coming Soon! A New Kelly Flynn Mystery Coming Soon! 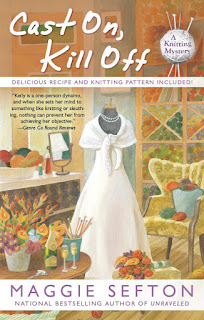 Hey, hey, Everyone. . .I'm officially proclaiming from the rooftops, the blogosphere, online, offline, and every way I can think of: the 10th in the Kelly Flynn Knitting Mysteries, CAST ON, KILL OFF, will be out June 5th. Wow, that's even hard for me to believe. Just looking at that sentence gives me pause. Ten. Ten Kelly mystery adventures have been published. Readers were first introduced to Kelly and her friends seven years ago in June 2005, and ever since then, I've been astounded by how many of you have taken Kelly and her friends to heart and joined in her adventures. Over ten books, readers have watched lots of changes come along for Kelly and Company. New friends have "walked onstage" and joined the cast of characters. There have been lots of good times, fun, and new relationships have appeared---along with several dead bodies. Can't have a murder mystery without a murder, right? And we can't forget the villains. There's never a lack of villains who resort to murder as a way to solve problems. And we can't have all those relationships without problems. Stress takes its toll on people as well as relationships. So, there have been tears along with the laughter in Kelly Flynn's world---just like there is in real life and in all our lives. If you've been reading all of Kelly's adventures, I think you'll definitely enjoy CAST ON, KILL OFF. The "drama, trauma, and melodrama" of Kelly's & Steve's breakup will finally be resolved. :) And, there will be lots of "wedding prep" scenes to enjoy leading up to Megan's & Marty's wedding. You'll even get to see a Megan Meltdown. And----there's even a fun scene in a cowboy bar which I think you'll all enjoy. I know I enjoyed writing it. For those of you who haven't tried the Kelly Flynn mysteries, maybe you'll be intrigued and give this a try. (The first book is Knit One, Kill Two.) If you do, I'd like to hear from you. maggie@maggiesefton.com. But I warn you. . .if you like it, then you will definitely want to find the earlier books and meet these characters way back in 2005 when they first walked onstage. Enjoy! Congrats on your 10th Kelly book! I am looking forward to reading it, but as I wait for the paperback, I am one book behind. That wedding dress, well, that is some kind of giveaway! I finished Cast On, Kill Off this past weekend and it is a great addition to the series. And a super ending, too. Aurian---No surprise. Megan & Marty tie the knot. Kristin A---That makes me feel good. :). I think you'll definitely enjoy it. So right, Maggie. I'm sure everyone will love the latest visit with our friends at the House of Lambspun. I know I did. Tell Carl to keep the faith, he'll chase that pesky squirrel out the flowerbed.